Checkers Industrial Safety Products has transitioned to Checkers Safety Group. With an aggressive growth path in 2015, acquiring seven companies, the company has rebranded its services under four powerful brands, each with a long history of success, providing even more value to its customers. We believe that marketing our services under four powerful brands, each with a long history of success, will have a greater marketplace impact, more clearly define our core product lines and provide even more value to our customers. Checkers Industrial Safety Products has transitioned to Checkers Safety Group. Checkers has been on a progressive path in 2015, acquiring seven companies; AlturnaMATS, GNR Technologies, Superior Manufacturing Group, SVE Portable Roadways, Terraplas UK and USA, Firefly and Zigma Ground Solutions with each acquisition bringing a number of important products and brands. As Checkers continues to grow as a ground-based safety solution company, the decision to rebrand was necessary. The new identity is based on research conducted with customers, partners from around the world and their valued employees. The new brand builds on the many improvements made to the business. Checkers' company vision is to be a dynamic, global team dedicated to protecting people, assets, and the environment. The new icon surrounding the Checkers name embodies those three equally important elements. The change from yellow to green symbolizes their commitment to sustainability, focus on social responsibility, and continued growth in the safety industry. Checkers Safety Group is committed to providing revolutionary product designs and innovations that are in line with their solutions-oriented approach. They believe that marketing their services under four powerful brands, each with a long history of success, will have a greater marketplace impact, more clearly define their core product lines and provide even more value to their customers. The four Power Brands focus on ground-level safety solutions. Tufftrak® Ground Protection Solutions boasts a broad range of light-, medium- and heavy-duty outdoor ground and turf protection products, such as temporary access roadways, platforms and flooring for special events. Monster™ Motion Safety provides products for “motion-related” activities, such as vehicular and pedestrian traffic safety with a wide range of wheel chocks, warning whips, industrial lights, parking stops and speed humps and bumps. All of Checkers' brands will continue to deliver quality products with the level of excellence and professionalism their customers have come to experience. As they continue to transition to the focus on these four power brands, customers will see the brands introduced in advertising, marketing materials and signage. It remains part of their communication strategy to maintain transparency and to keep customers fully aware of developments around the rebrand process. Checkers will continue to bridge new gaps while simultaneously expanding their resources across the safety market. Checkers appreciates their customer's support and continued confidence in their company. If any questions should arise please contact a Checkers sales representative. Checkers Safety Group is a dynamic, global team dedicated to protecting people, assets, and the environment. Checkers Safety Group is headquartered in Broomfield, Colorado and has manufacturing facilities in Arizona, Colorado, Illinois, Mississippi, Pennsylvania and Texas in the United States as well as in Canada, Mexico, the Netherlands and United Kingdom with global distribution. 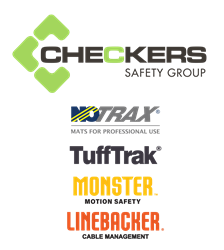 Checkers Safety Group is dedicated to providing revolutionary product designs and visionary ground-level solutions to the safety industry.